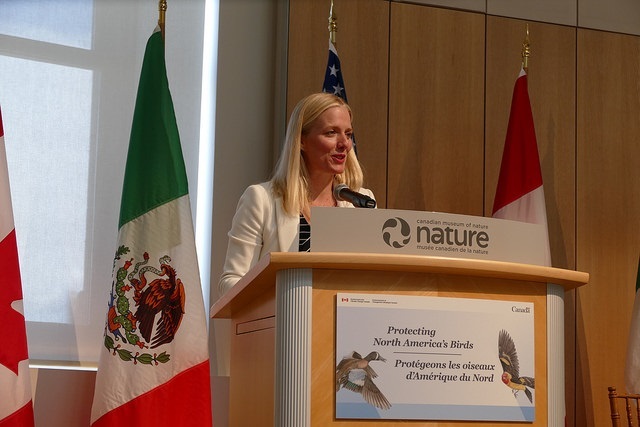 May 18, 2016: The Honorable Catherine McKenna, Minister of the Environment and Climate Change released the State of North America's Birds 2016 Report, at the Museum of Nature in Ottawa today. She was joined by the heads of the Trilateral Committee in releasing this innovative tool. A simultaneous event to release the report was held at the Canadian Embassy in Washington, DC. The report is the first comprehensive assessment of the conservation status of all 1,154 bird species that occur in Canada, Mexico and the continental United States. It highlights the challenges and crises in bird conservation, successes of past and current conservation actions and identifies ways in which everyone can contribute to the conservation of healthy bird communities. Indicators reveal that one-third of North America’s bird species are of major conservation concern. Tropical forest and oceanic species show the greatest losses, but coastal species as well as those in grassland and arid land habitats are also declining. However, change is possible with collaboration and commitment. Thanks to the actions of scientists, governments, non-government organizations, other partners and citizen scientists in the three nations, the State of North America’s Bird report will be an invaluable tool in protecting nature’s resources for the benefit of people, birds and wildlife.